Recognisable by the wooden look and -of course – the orange logo, the Dutch brand Lieuwe delivers handcrafted custom boards. We see more and more people riding with those stylish twin tips and yes at least one of the three different twin tips is a hit in the bulls eye. It is the fourth brand we have tested so far which produces twin tips trying to out perform in quality the boards from more established brands like F-one and North. And to our judgement Lieuwe does that clearly with succes. Lieuwe arose, like some other brands as Saul customs, from a hobby to a profession. Out of interest in riding a perfect twin tip themselves Florian, the main shaper of Lieuwe, turned the board shaping for friends slowly but steadily into a board shop from 2014 onward. Florian’s second name, Lieuwe , stands for a young, small group of guys who are full of fresh energy, ready to conquer the world. 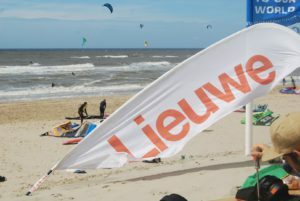 The 2016 Lieuwe line up consists of three different twin tips (they stopped selling the fourth -fin less- one, al though it may still be on the webpage). 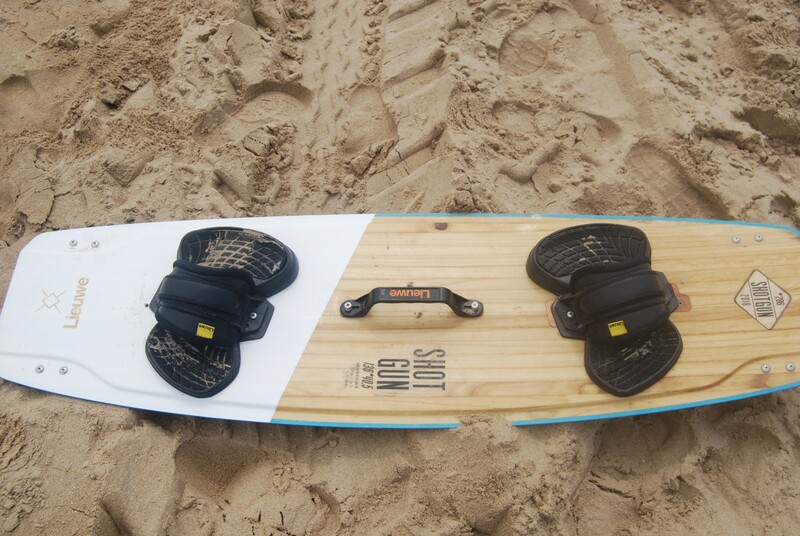 One board that is described to be for beginners, one for freestyle and all round use and a wake style boards. 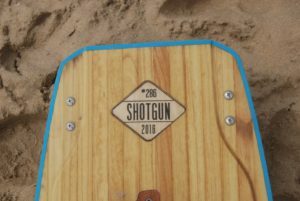 We had a chance to test the Shotgun, meant for all round and freestyle, and the Say No More wake style board. Prices of those two boards start at 700 Euro. Adding specific “custom” looks will quickly add a hundred or two, but since the wooden looks remain mostly visible it is not very outstanding to the standard looks. We wouldn’t be bothered to pay extra for some distinguished looks, but that remains something personal. Speaking of carbon, there is non present in the Lieuwe boards. 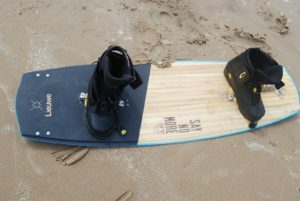 Lieuwe, similar as Alvaro Onieva’s Clash and for example Saul customs, is not really fan of using carbon in their boards. Main reason is that it doen’t add too much quality in the ride and on top of it the boards tend to break much sooner. We really liked the options the Lieuwe boards offer for different types of bindings. It has 10 inserts (!) for each strap or boot, just to be sure all straps or boots will fit. And yes not only the “unbreakable” wakestyle Say No More can be ridden with boots but also the “freestyle/ allround” Shotgun is able to deal with the hammering from riding with boots. Lieuwe doesn’t mention this on it’s site though. The standard provided straps are okay and it is nice to be able to choose from different colours, but are nothing special. 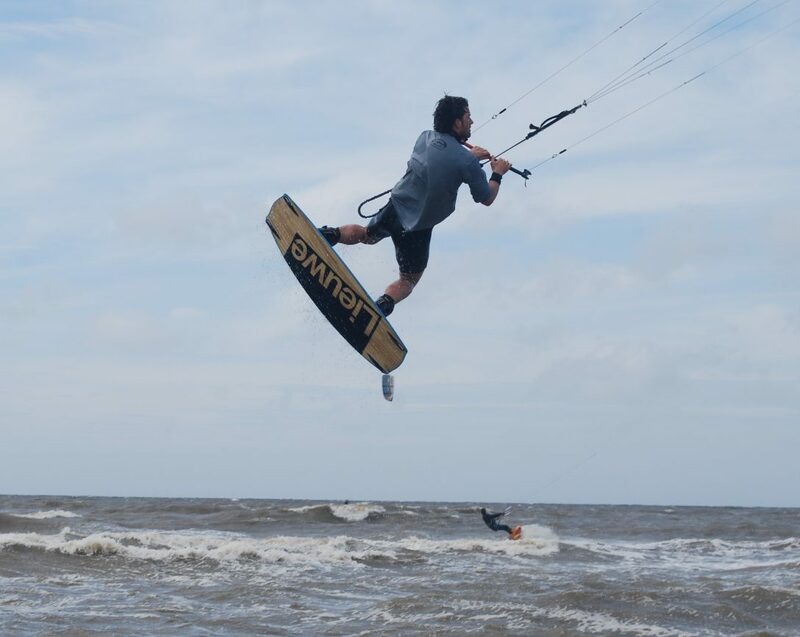 For example the Naish Apex are more comfortable, more expensive but we think it is worth it. A small bonus is the possibility to choose for either normal or wake style fins (as preferred by most boots riders) including a stylish Lieuwe logo on them. It seems like an open door, but not every brand will offer the possibility to get the board with wake style fins. To start with the conclusion; the Shotgun was our favourite. It has a perfect combination of delivering a super nice to aggressive pop, speed and up wind riding. Don’t get distracted by the all round wording on this board, it clearly doen’t ride specifically as a beginners board. Most of the kiters will benefit endless from this board. The Shotgun is shaped a bit straighter than the Say No More. The shape, flex and -great- feeling is quite comparable with the Ride Clash 2.1. Both boards are remarkably fast. Faster than most other twin tips and are very well shaped to cut through rough choppy water. The speed in combination with the aggressive en responsive pop can be used to perfectly hit a wave and jump as high you dare to come. The website described playfulness is there, but different than that -for example- of a F-one Acid. An Acid lays much looser (and feels softer) on the water where the Shotgun is more on a fast track which can be ridden with lots of power on the rail. The Shotgun will especially be loved by riders that are a tiny bit more experienced than average. On top of that these boards will probably last a lot longer than other twin tips. 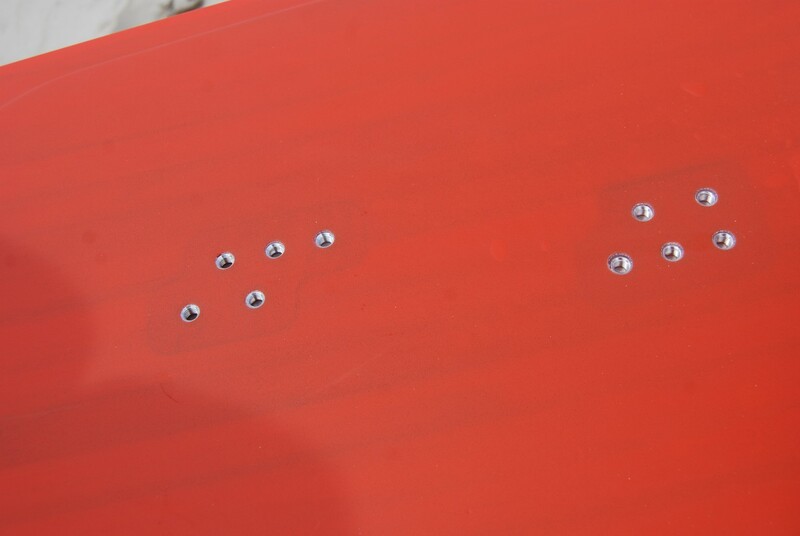 No soft bending, vulnerable fins as on the F-one boards and inserts that look like (and promised) to be bulletproof. There are 4 different sizes of the Shotgun and for a 80 kg rider the 136 by 41 Shotgun (second to biggest one) is perfect. In that view the Wake style Say No More board is a bit over the top for most riders. Promised to be unbreakable (first stated selling point on the Say No More on the Lieuwe website!) and as expected it is more curved (rocker), stiffer and heavier than the Shotgun. These aspects, especially the amount of rocker, almost automatically bring a reduction in speed and reduces the up wind capabilities but will bring a more aggressive pop. The Say No More felt not as radical as the Airush Livewire, which is also wider and it has not as much rocker as the Crossover from Saul Customs but still is only a perfect match for the rider who we don’t need to explain they have to go for a wake style board. We, and probably most other riders, however just loved the Shotgun. Lieuwe Shotgun (with fins, pads&straps, standard looks) 699,- Euro. Lieuwe Say No More (with fins, pads&straps, standard looks) 699,- Euro. I might still say the 136cm should suite you with 71kg’s. I have already talked Lieuwe they don’t have a distributor yet. Where are you at? We might arrange a test board for you depending on your location. Thank you Dave for your answer! Do you think that in terms of stiffness the shotgun is like the north Jaime or is it stiffer ? Unfortunately I can not lest it because no one sell’s it around here. Thanx again for your time ! Many thanks for your compliments, that is very much appreciated. As for the Shotgun; It is one if the best boards we have tested and we know a lot of people bought it and are very happy. But be careful, the happiness is all about the performance. It is super fast and does handle chop very well. But it is not the most comfortable board out there. There is sort of an trade off if you want comfort and more performance. 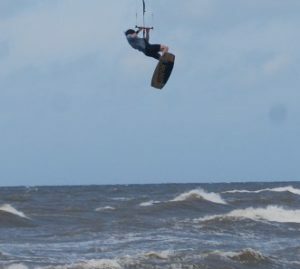 For example the Say no More and many other wake style boards is not our thing often because there is little or no comfort (hard landings). As for spray; in general you will need a bigger board for less spray. The Lieuwe Shotgun is not a special anti-spray board, so it is very important to buy the right size. As for the Trax; the Acid would have been a better choice in your situation, but that board is not made any more in 2018. (The WTF is something completely different). We can name numerous options of other boards like the ones from Saul custom’s Pure but this is just one of many choices. We recommend to test yourself, if possible. Congratulations on your reviews i follow your web site and tell my friends about it from yhe day i came across it. 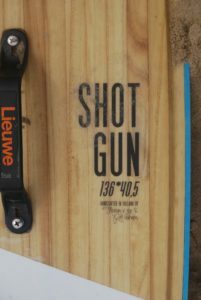 i would appreciate your advise in the Lieuwe SHOTGUN, i had a Wainman Blunt which felt grate with really nice flex and no spray!! I have had a knee injurie and i need the board to be not too stiff, more or less medium flexed. What is your opinion about the stiffness and spray i am asking because i ride only in choppy water. Yes that is exactly how I think about it! Hey Dave thanks a lot for your quick reply, so it seems that lieuwe made a very good impression, that’s what I wanted to know if at that price (with transport it costs around 800-840€) it delivers the same or better than the more popular north ts! Both are for sure good boards. Money wise your choice seems simple; The TS will keep its value, while the Lieuwe (if you ever want to change to a newer board) is less known and thus less wanted. The TS has a bit lighter feel, but most aspects are quite similar. But frankly if money wasn’t any issue I would prefer the Lieuwe. It has some more liveliness and seems a bit more aggressive. I also rode the Lieuwe with boots which also was a perfect combo. I could only use TS on the North boots, but those boots bothered me too much to say how the TS really is with boots. Hope this helps making your choice! Hey, I love your reviews, they are very informative and helpful, it’s very hard to find good unbiased reviews! From what you say the shotgun seems a really nice board, can you please tell me a comparison with the team series (because I was set to buy the TS) , pop, landings, feel in chop,weight, because the lieuwe are about the same price with the ts (I have an offer for the ts actually cheaper) 🙂 thank you very much in advance and for taking the time to write these reviews!